Whitehall Studio is a luxury knitwear brand that values quality materials, sustainability, craftsmanship and original design above all else. All of the yarns used are high quality natural materials, manufactured within the UK. I work with a yarn merchant in Rochdale to source redundant industrial waste yarn from high end UK labels that would otherwise end up in landfill. I combine this with cashmere and lambswool from a small Scottish mill that has been in continuous operation since 1778. This means that many of my ranges are limited editions and very low waste. And they are all made with great care and attention to detail. Everything is machine washable and comes with full care instructions and spare yarn. Each garment is intended to be kept and cherished for a lifetime. Each of my knitting machines are inherited or bought second hand. 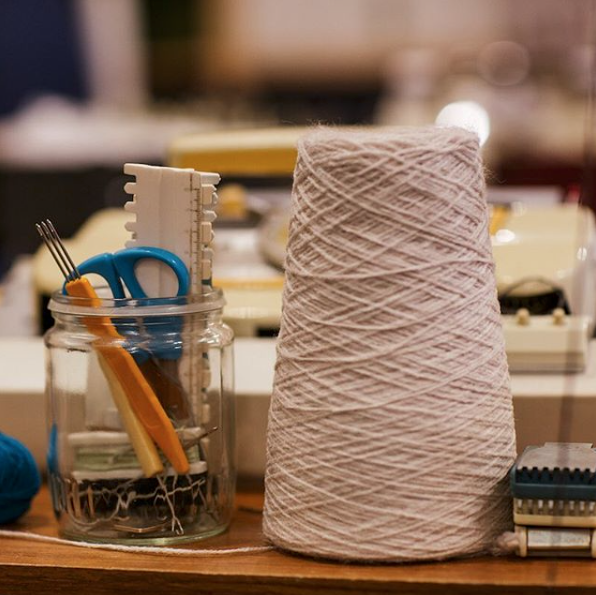 It’s amazing how many people I meet have a knitting machine gathering dust in an attic or cupboard or know a family member who used to have a machine. Yet machine knitting is a craft that is often overlooked in favour of the more in vogue hand knitting and crochet. Whilst I love both of these, and macramé too, I am passionate about promoting machine knitting as a creative outlet as well. Through open studio events, demonstrations and workshops I aim to encourage people onto the next step of knitting with a machine, which opens up a whole other dimension. Everything from Whitehall Studio, including every pattern, is created by me. I strongly believe in original work and am particularly inspired by the past and heritage; my final collection was based around derelict houses in Burnley and LS Lowry! I am also drawn to folk and vintage patterns and mid-century design. I love colour and patterns and this can be seen in all my work. I live in a beautiful part of the country, near to Hebden Bridge in West Yorkshire, and the unique surroundings here always influence my work. As does the Yorkshire weather! I love the outdoors and when I’m not knitting in my studio, I’m out running. Although I’ve still not conquered my fear of fell running! This outdoor, off-duty lifestyle is always front of mind when I’m thinking about the end use of my garments. As an antidote to the increasing speed of change in fast fashion, I consciously want to slow things down and work to a smaller scale. My collections are modern re-workings of classic items and I aim to create timeless pieces that can be worn “off-duty” wherever or however you are relaxing. Quality knitwear for your quality time. I’m Nic Corrigan, owner, designer and maker behind Whitehall Studio. Whitehall Studio was founded in 2014 but my love of fashion started much, much earlier than that. My favourite items of clothing are indelibly inked in my memory; from a pale lemon ra-ra skirt from Taunton market to a wannabe Durannie trilby hat that was devastatingly lost at Gillingham Ice Rink. Hours were spent drawing fashion models and sketching new outfits for them, which always seemed to be finished off with killer stilettos. I also loved knitting. I can’t remember when I learnt, or even who taught me but I also can’t remember a time when I couldn’t knit. This fascination with designing and making carried on throughout my schooling culminating in a fashion show where I made tens of pairs of Capri pants in red, yellow and blue! Maybe this was enough to finish me off as I packed away my sewing machine and my knitting needles to go off to University to pursue an academic path and a career in marketing. After a few years, it became clear that something was missing and in search of more fulfillment, and to answer a few niggling questions in the back of my mind, I went back to University to study Fashion Design not knowing where it would lead. I loved getting back into a creative environment and during my placement year at Coast I was given a 2nd hand knitting machine. This opened up a whole new world to me and I ended up using it to produce my final collection. Several years followed working in industry with a host of High Street retailers from River Island to Republic. At first this seemed exciting and glamorous. But the fast fashion industry is a notoriously harsh environment and I grew increasingly worried about the pressures and cycle of overseas production which meant frequent long trips to China and the Far East. I also felt far removed from the creative process I had been trained in. Finally in 2014, I decided to take the plunge and launch my own label. Whitehall Studio was born.